Don’t call it a comeback, unless you want to get technical, because technically, it’s a comeback. 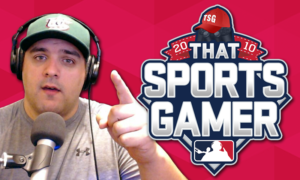 After months on hiatus, which saw the birth of my son, me taking over as Baseball Community Manager for Out of the Park Developments, and much more, ThatSportsGamer Show is coming back. With the relaunch I’m going to be changing up the format of the show. Rather than the long form group shows that we’ve done in the past, I’m going to try out something different. The majority of the episodes will now be ThatSportsGamer Show Hit & Run episodes. These will be short solo episodes, roughly 5 to 15 minutes, and cover one recent topic in sports gaming. Since these Hit & Run episodes are going to be shorter, the plan is to target doing two or three episodes per week depending on what is happening. While the majority of episodes will be this new format, the plan is to still do full size ThatSportsGamer Show episodes revolving around larger topics, such as review panels, from time to time. I hope you enjoy the new format, and if you have any questions, comments, or suggestions for show topics, please reach out to me on Twitter, @ThatSportsGamer, or you can send an email to Feedback@ThatSportsGamer.com.